RAMCO Industrial Hot Air Parts Dryer have been proven to be very effective for rapidly drying parts without using excessive heat. The key to the process is the process elevator. It is used to produce changing flow patterns that result in a dynamic drying mode (i.e. platform oscillation combined with hot air flow). 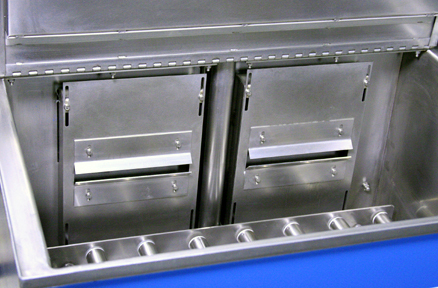 The effect of dynamic flow combination is better coverage of component surfaces, maximum evaporation and accelerated processing times. The air is electrically heated, directed into the drying chamber via adjustable air knives and continuously recirculated. The elevator constantly oscillates the workload in and out of the hot air stream. Using high volume hot air combined with the changing air flow patterns created by the process elevator results in maximum evaporation. Humid air is displaced with just the right amount of fresh air to maintain effective air quality within the chamber. The dryer is electrically heated and includes a digital indicating temperature controller, high temperature manual reset and an air flow proving switch to protect the heaters. 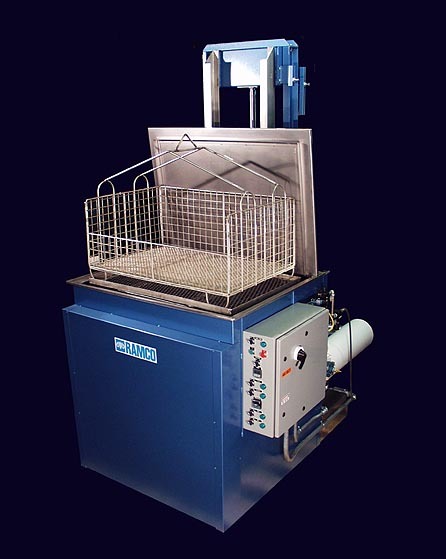 Matching Hot Air Knife Blow-Off Dryers are made for all standard model RAMCO Parts Washers in the MK and CM Series as well as custom sizes. The top photo is a small dryer made for an 28″W x 15″L x 10″H basket with a maximum weight load capacity of 150 pounds. The bottom photo is a large custom dryer made for a 40″L x 30″W x 36″H basket with a maximum weight of 1000 pounds. 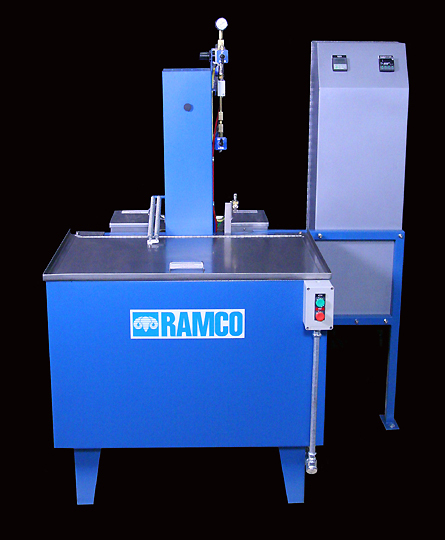 Big or small, RAMCO Dryers are known for getting results in challenging applications.